It's a match made in . . . Sonoma County. Santa Rosa's AbsoluteXtracts and Petaluma's Lagunitas Brewing Co. have partnered to create two new products that are unique to Sonoma County and may signal more alcohol-cannabis collaboration in the years ahead. 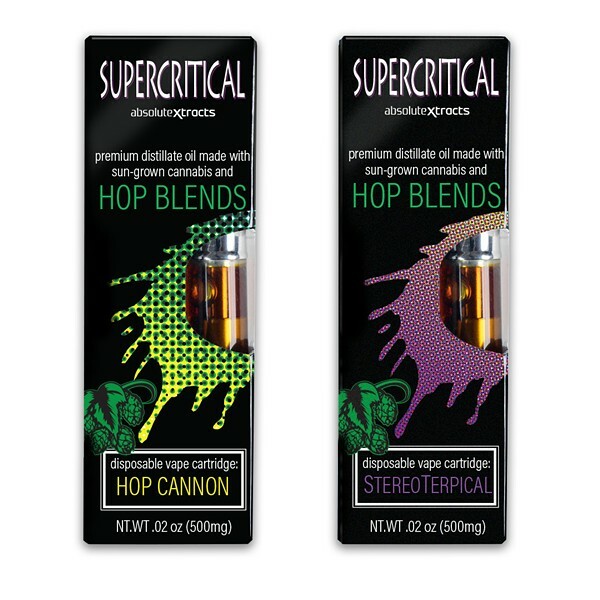 This month, Lagunitas released Super Critical Ale, a THC-free beer made with cannabis and hop terpenes, the fragrant oily compounds that give cannabis and hop strains their characteristic taste and aromas. While the beer is non-psychoactive, it weighs in at 6.6 percent alcohol by volume and 88 IBUs. The beer is named after the CO2 extraction process used to isolate and preserve cannabis and hop terpenes. Super Critical Ale is brewed with seven hop strains and cannabis terpenes from Blue Dream and Girl Scout Cookie cultivars. The limited-edition brew will be available on tap only at select locations like Brewster's in Petaluma and Sprenger's Tap Room in Santa Rosa, but word is it's going fast. On the flip side, AbsoluteXtracts debuted its version of Super Critical, a cannabis vape catridge infused with hop and cannabis terpenes that the company says will give the products a distinct Lagunitas flavor. At over 80 percent potency, this one definitely has THC in it. The vape catridges are available at dispensaries throughout California. Kial Long, vice president of marketing for CannaCraft, AbsoluteXtracts's parent company, said Lagunitas and AbsoluteXtracts have been chatting about partnering for a year but only got serious in the past month. Because both companies use the super critical extraction process for hops and cannabis respectively, exchanging one oil for the other made production easy, says Long. The collaboration comes from the companies' appreciation for one another's product. "We've always noticed a lot of similarities between our industries, and we wanted to see what we could come up with if we started brainstorming together," said Karen Hamilton, director of communications with Lagunitas, in a statement. While this is the first time Lagunitas has made beer with cannabis oils, it's not the company's first weed-friendly beer. The brewery's OneHitter series (ahem) includes the Waldos' Special Ale, an ode to the supposed originators of the term "420." Earlier this month the Wine Industry Network hosted its Wine & Weed Symposium in Santa Rosa, a sold-out event that explored collaboration between those two industries. Long says the partnership with Lagunitas is their first such collaboration, and she sees more alliances in the future. "Everybody is talking about it," she says.